Dr Ron Runnebaum works on improving processes for more sustainable use of natural resources, including those important in winemaking. This involves the development and use of solid materials that can be regenerated and reused and can replace chemicals and reduce solid waste production. His wine research includes seeking alternatives for removing potassium bitartrate and proteins. Ron earned his MS in viticulture and enology at UC Davis. He has worked in the cellars of J. F. Mugnier in Burgundy, as well as Hanzell Vineyards and Acacia Winery in California. Ron pursued his PhD in chemical engineering working on the catalytic conversion of biomass to value-added chemicals and fuels. 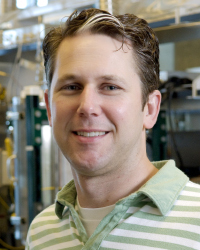 He completed a postdoctoral fellowship at the University of California, Berkeley, in aspects of chemical catalysis, where his work was published in journals including Nature Nano, Journal of the American Chemical Society, and ACS Catalysis. Ron will address New techniques and technologies for cold stabilisation of wine on Wednesday in Session 10.